Erie, Pennsylvania – Erie Otters General Manager Dave Brown announced today that the Otters have hired Chris Hartsburg as the team’s eighth head coach in its Erie history, while promoting B.J. Adams to Associate Coach and extending him and Assistant Coach Wes Wolfe through 2020. Hartsburg returns to Erie after serving as the head coach of the USHL’s Lincoln Stars since the 2014-15 season. The 37-year-old guided the Stars to an 83-83-14 record during his three-year tenure in Lincoln, including a 28-point turnaround and a playoff berth during his second season in 2015-16. The Sault Ste. Marie, Ontario native served as head coach of Team West at the 2016 USHL/NHL Top Prospects Game and also helped guide the United States Junior Select Team to a gold medal as an assistant coach at the 2016 World Junior A Challenge. Prior to joining Lincoln, Hartsburg served as an assistant coach for the Erie Otters under Kris Knoblauch in 2013-14. 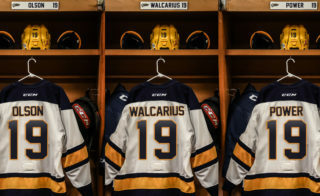 During his only season in Erie, the Otters improved their win total by 33 for the franchise’s best single season in team history with a record of 52-14-2-0 with 106 points, and a Western Conference Final appearance. 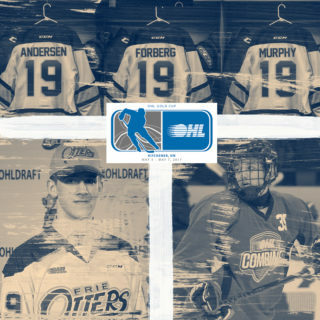 At the helm of the defense, the Otters limited teams to an OHL and franchise best 170 goals that year, while the penalty kill finished at 84.1% under Hartsburg, good for second best in the OHL. 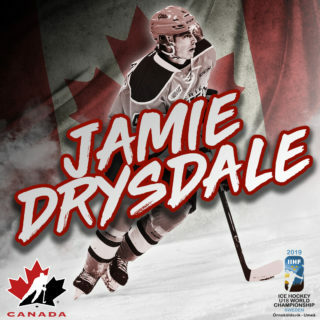 He also spent four seasons as an assistant coach with the Everett Silvertips of the Western Hockey League from 2009-2013, and a season as an assistant coach with the Colorado Eagles of the Central Hockey League for the 2008-2009 campaign. Hartsburg’s playing career spanned six years in the professional ranks with the Albany River Rats and Colorado Eagles following his four seasons at Colorado College, where he was selected by the New Jersey Devils in the 7th round of the 1999 NHL Entry Draft. Brown also announced the promotion of B.J. Adams to the role of Associate Coach, while also extending him and Assistant Coach Wes Wolfe through the 2019-2020 season. 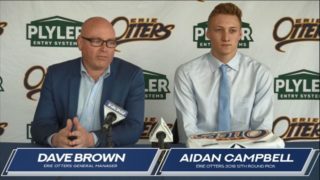 As the defensive assistant, Adams has helped the Otters to two straight Hamilton Spectator Trophies as regular season champions, as well as the J. Ross Robertson Cup as OHL League Champions this past season. The Otters have finished second in the OHL in team defense in each of the last two seasons under Adams, while his penalty kill finished in the top five during that same two-year stretch. 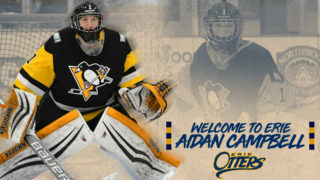 The Scarborough, Ontario native joined the Otters in 2015 following a five-year stint with Canisius College in a similar Assistant Coach role. Wolfe joined the Otters for the 2016-17 season as an Assistant Coach following his season with the St. Catharines Falcons of the GOJHL where he served as Head Coach and Assistant General Manager. The Niagara Falls, Ontario native has helped improve the Otters outlook into statistical information with his background in analytical data systems that has further advanced the team’s player development model. 2017-18 Erie Otters season tickets and flex packages are currently on sale and can be purchased at the Erie Otters front office, located at 201 East 8th Street. For more information, visit our season tickets page, or contact Darcie Chabola at 814-455-7779 or via email darcie@ottershockey.com.